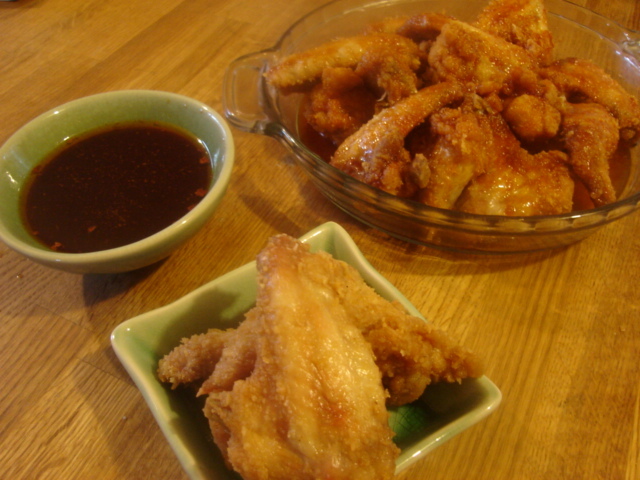 You can pour the sauce over your fried chicken or use it as a dipping sauce on the side. and wish there was some fried chicken in the house. Sometimes I even think about where my husband might be on his pickups around Maryland and D.C. pumping out waste oil from closed restaurants and wonder if calling him to pick up some fried chicken on his way home at 3 a.m. would be thoughtless. and what is Conan doin’ now??? Just me and my chapstick and ROC age defying night cream. Did I smear enough on? When he has leftovers from a catering job I am often the fortunate recipient and can be found snarfing over trays of picked over hor dourves. Let there be late night indigestion!!!!! 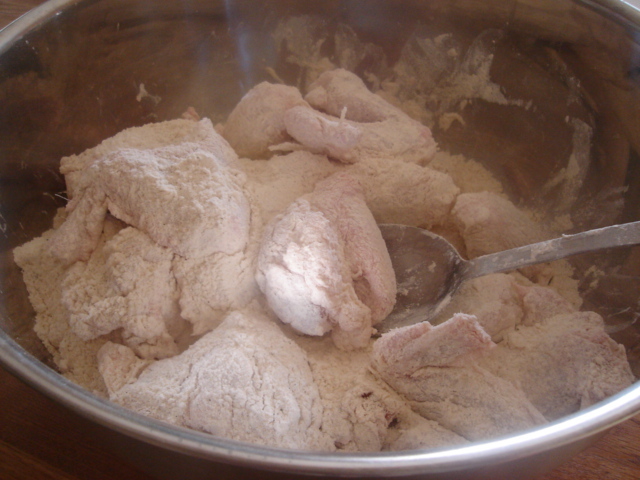 In a large bowl mix all the dry ingredients and then toss the chicken pieces in the mix. Let sit in the fridge for at least an hour so batter will stick to chicken. floured chicken ready to sit in the fridge for 90 minutes or so. Time gets that thin crust to stick good. Heat a pot of oil to 350 F.
Carefully lower in a few pieces of chicken at a time. Do not crowd the chicken (or the pieces won’t crisp they will steam). It don’t get no easier than this! Put butter, hot sauce, pepper and garlic in a saucepan and heat through. Pour over fried chicken or use as a dipping sauce. 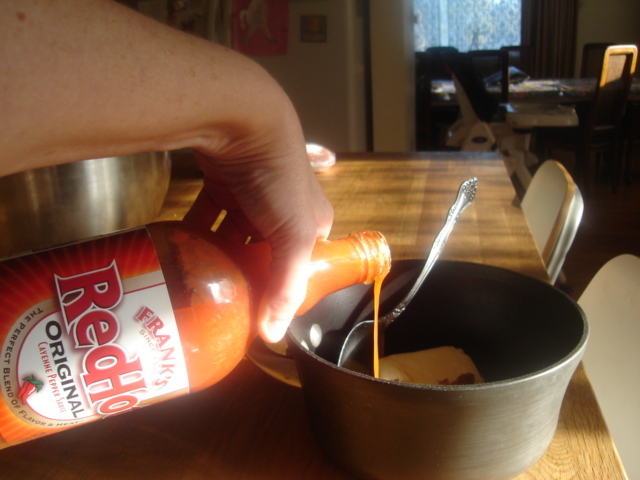 Mixing up the Hooter's style hot wing sauce. As an alternative add 3 tablespoons brown sugar in to the sauce recipe. Great flavor for those who like sweet and hot. Your week night fast and easy fried chicken recipe with hot sauce. Make some mashed potatoes and peas on the side and you are good to go! This is gmom and Cujo wishing all the working WPer’s out there a safe week!